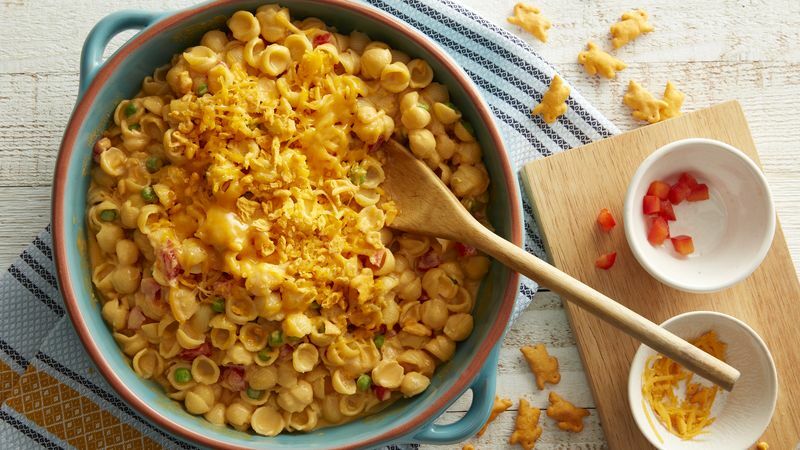 In 2-quart saucepan, make Shells & Real Aged Cheddar as directed on box, increasing milk to 1/2 cup. Remove from heat. Stir in bell pepper, sweet peas and 3/4 cup of the cheese until well mixed. Cook over medium-low heat 3 to 4 minutes, stirring occasionally, until heated through and cheese is melted. In small bowl, mix remaining 1/4 cup cheese and the crackers until well mixed. Sprinkle evenly over shells mixture. Serve with crusty French bread. For a complete meal, add your favorite veggie protein or grilled chicken.